CURTIS, Neb. – There were no winter blues for the NCTA Aggies of Curtis, Nebraska on Saturday during the season opener for collegiate crops judging teams gathered at Hutchinson Community College, Kansas. 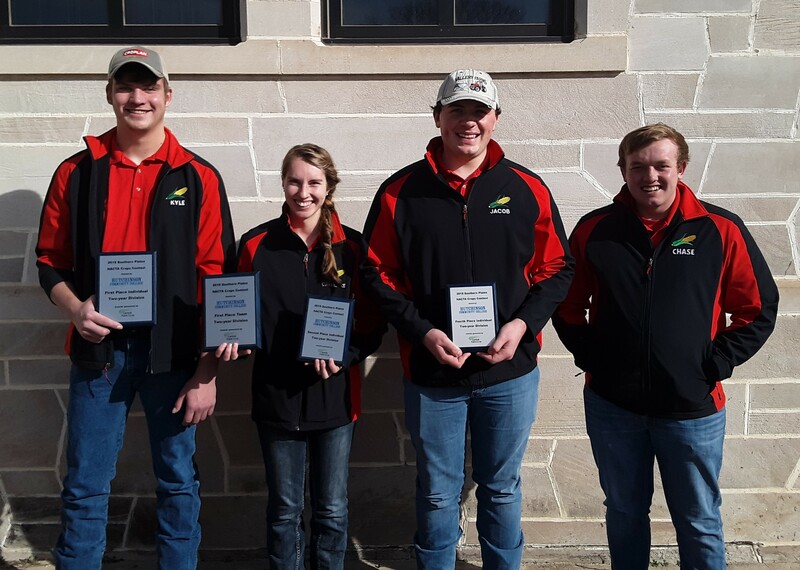 Agronomy green was the theme for the Nebraska College of Technical Agriculture which took top team honors and placed all four team members in the top seven in the 2-year college division of the competition. “It was a good opportunity for our students to apply what they have learned in the classroom and field labs as they are tested on their knowledge of plant and weed identification, agronomic practices and problem solving skills for crop conditions,” said Brad Ramsdale, Ph.D., agronomy professor and crops judging team coach. The Aggie team was led by three second-year students Kyle Krantz of Alliance in first place. Catherine Ljunggren of rural Hamilton County near Harvard, was second place. Jacob Vallery of Plattsmouth placed fourth. In his first collegiate contest, freshman Chase Callahan of Gothenburg placed seventh. Six other first-year students from NCTA also participated in the unofficial portion of the event, learning how a collegiate contest operates and gaining experience in a competitive atmosphere, said Professor Ramsdale. Amy Lammers, Axtell, Tyler Aschenbrenner and Ethan Aschenbrenner of Scottsbluff, Korbin Moore, Gothenburg, Colton Bell, York, and Clade Anderson, Otis, Kansas, traveled with the team. The contest included 100 students from four 2-year colleges and nine 4-year schools. The next contest for the Aggies is March 8 when the NCTA Agronomy Division hosts a collegiate contest at the Curtis campus.